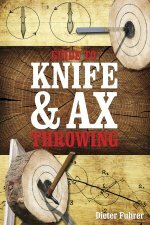 The books and videos on knife throwing presented here will help you to dive deeper into the sport. As with every sport, there is no such thing as the one and only correct technique, but rather many different styles, and you will like some better than others. So, I recommend that you first read the pages here at Knifethrowing.info thoroughly to get familiar with the basic facts and throwing styles, and with this solid background knowledge then use the media list below to learn about other variants of throwing knives. There are other knife throwing book lists at Sticking Point, and Thrower. This is a very nice video to get started with the sport of knife throwing, but it also offers interesting chapters for the advanced thrower. The author, John Bailey, has taught many people how to throw knives using his "brach-chopping" technique. We have a review of this video online, and you can buy it on DVD in our online-shop. This is the sequeal to Recreational Knife Throwing (obviously :-) You will be see demonstrations of some new throwing techniques, and John will show you round his collection of throwable objects. The video is intended for the advanced thrower. We have a review of this video online. "The Great Throwdini", the knife flinging minister, shows his skills and demonstrates his style of throwing. Also included is an introductionary chapter for beginners. We have a review of this video online. Read our review of the original 1995 version, and of the 2015 remake. In the first version, the authors shows how to throw pocket knives in such a way that they stick in the target. He always uses a blade grip, even on the handle. The second (2015) version is proof that sports knife throwing has taken a hold, with Michel Dujay now using heavier knives, and stressing proper technique. Charles E. Tuttle Company, Inc. The standard; The author was a master of the art and founder of the famous Tru-Balance Knife Company. Here you will find explanations of different grips and throwing styles. They are all tailored for the heavy American throwing knives, but most can be adapted for lighter ones. The professional style used by circus-artists and professionals is also detailed. A whole chapter is dedicated to the throwing of tomahawks and axes, another presents famous knifethrowers and their stunts. This sequel to Knife Throwing: A Practical Guide first sums up the the basics presented there. The history of knife throwing is interesting to read. A part of the book deals with the throwing of tomahawks. In the remaining chapters are little anecdotes about famous knife throwers, their lives and stunts (in more detail than in the first book). A comprehensive handbook on knife throwing, with nice photos of the throwing motions. All important topics are covered, on occasions with rather compact explanations. Absolutely to be recommended for beginners! The Art of Throwing: The definitive Guide to Thrown Weapons Techniques, book by Amante P. Mariñas, Sr.
For the advanced knife thrower, who wants to put its own experiences into a bigger concept. For those that want to read about throwing weapons beyond axes and knives. Available dirctly at Ethnographic Art Books, the museum's publisher. Beautiful photographs of the collection of African throwing knives in the Ethnographic Museum in Leiden. 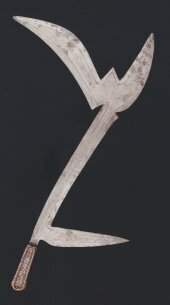 The catalogue contains introductionary chapters on the origins of the collection, and on the proliferation and use of throwing knives in Africa. First published in 1948 in Kassel, Germany, titled "Der Mann mit den Messern"
Germany, just after WWII. An ex soldier is living in the ruins for and off his knife throwing skills. But even his most astonishing solo act (wooden block on the head) fails to engage the audience at the varieté. I very much enjoyed reading this short story, which is readily available at antiquarian booksellers. For William Gurstelle, knife throwing is one of the "art[s] of living dangerously". The brief chapter on throwing knives is well written and accurate, but of course less throrough then the books above or our own instructions on how to throw a knife. The short story relives the performance of an artistic knife thrower. Hensch, the artist, gained a sordid reputation for going beyond the thrill of ususal knife throwing acts. Hi is drawing human blood. Luckily, such stupidly dangerous performances only exist in works of fiction. Collections of bits and pieces on knife throwing, based on decades of experience as a knife thrower. The work is non-comprehensive, all hints can be found elsewhere (see books above), and any interesting aspects mentioned do lack detail or explanation. Shenk's most useful and very true remark: Don't throw if it's getting dark, because you won't be able to see bouncebacks. The prices given are intended as rough indication for the reader. They are nonbinding and also refer to the time the article was added to this list. The video-icon (icon_video.png) above was made by Hbons and was published under a Creative Commons (Attribution-Share Alike 3.0 Unported) - license. The book-icon (icon_book.png) above was made by Mark Andrew.